The diagram below illustrates the development of the uredial stage of a typical rust disease. This is equivalent to the life cycle phase in daylily rust which affects daylilies as opposed to the alternate host Patrinia, on which the process would be different. This diagram is reproduced courtesy of M. Hahn and K. Mendgen, Konstanz University. The penetration phase shows a rust spore which has landed on the surface of a plant leaf. If leaf moisture and environmental temperatures are suitable, the spore will "germinate" and the fungus will then penetrate the leaf as illustrated. In most rusts, including daylily rust, this is done through the pores on the surface of the leaf (these pores are known as stomata, singular - stoma, and their function is to control the movement of gases into and out of the plant). There are some rusts, however, where it has been reported that spores can penetrate the leaf directly. 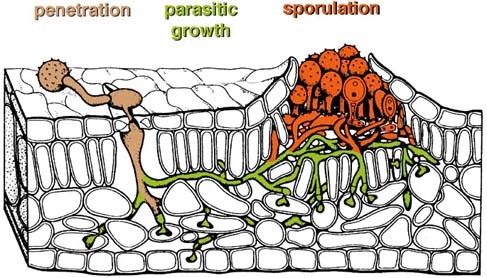 This diagram shows the "germ tube" growing out from the spore and identifying, mostly by sensing changes in the surface topography of the leaf, a stoma over which it forms a flat structure called an "appressorium". From the appressorium, the fungus then grows through the stomatal opening into the leaf. Fungal threads called hyphae, collectively known as mycelium, then grow amongst the internal cells of the leaf. As shown in the diagram, hyphae also penetrate some individual cells. In each entered cell is formed a "haustorium" which is the part of the fungus that absorbs nutrients from the plant. (Some rusts overwinter as mycelium inside areas of the plant which are not killed by freezing, and become active again the following spring). Until the next stage of the infection, little evidence of rust is visible on the outside of the leaf. Eventually, the fungus forms a blister, or "pustule", which presses against the plant's epidermis (skin) from inside the leaf and finally breaks through as shown, releasing more spores into the environment. This is called sporulation. These new spores can then spread via the wind, direct contact, insects etc. to other leaves, plants and gardens where they restart the process again when environmental conditions are suitable and the new plant is susceptible to that particular rust.